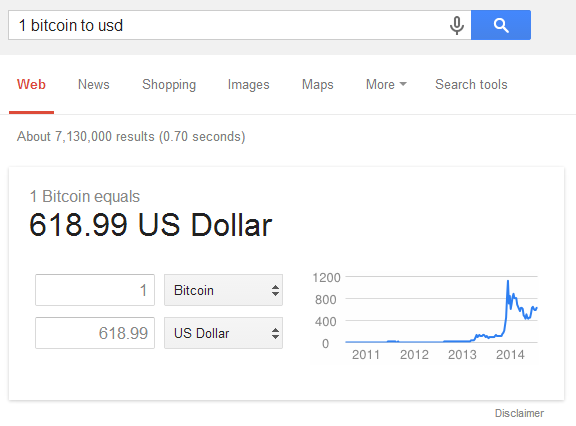 Google's currency conversion added support for bitcoin, a virtual currency introduced in 2009. If you search for [1 bitcoin to usd], [1 BTC in USD], [bitcoin eur], [convert 1000 gbp to bitcoin] and other similar queries, Google shows the interactive currency conversion card that also includes a historical chart. Last month, "Google Finance partnered with Coinbase to launch a bitcoin price tracker that enabled BTC-to-fiat price conversions across a wide range of global currencies." This update uses the same data. "Bitcoin is often referred to as a currency, but it does not conform to widely used definitions of money," suggests Wikipedia. "Economists generally agree that to qualify as money, something must be a store of value, a medium of exchange, and a unit of account. Bitcoin has some way to go if it wants to meet these criteria. It does best as a medium of exchange." [Video] Easy Loophole To Turn $10 To $100,000?